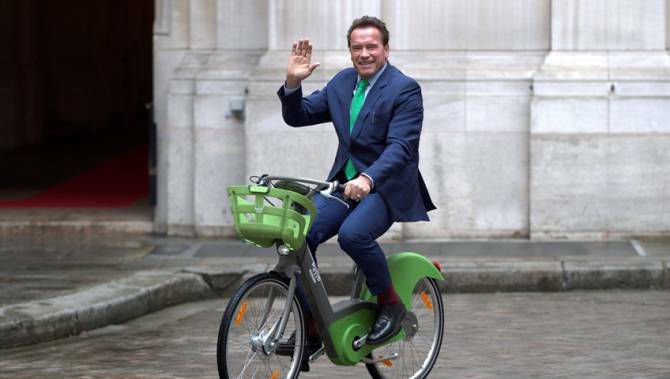 On the eve of the One Planet Summit, Arnold Schwarzenegger arrived on a green bicycle at the Paris City Hall where he joined Anne Hidalgo, Mayor of Paris and Chair of C40, to demonstrate the health benefits of climate and air pollution policies for cities and regions. Together, they presented the findings of a new research by C40 Cities, which revealed that improvements to the air quality, by for example meeting the commitments of the Green & Healthy Streets Declaration and encouraging more people out of their cars could prevent more than 45,000 premature deaths each year. Governors and Mayors have a duty to protect the health and safety of their citizens, and air pollution is one of the greatest threats to mankind, with over 7 million people dying worldwide every year. Together, through the R20 and C40, we will inspire subnational leaders around the globe to focus on the immediate dangers and health impacts of fossil fuels. Anne Hidalgo and Arnold Schwarzenegger further highlighted how walking or cycling to work is not only good for the planet, as it reduces greenhouse gas emissions, but also for the health. A message World champion cyclist, Peter Sagan, supported by sending a video encouraging people to bike. Following on the signature of a Memorandum of Understanding in April 2017 to increase collaboration to tackle climate change, R20 and C40 reaffirmed their commitment to collaborate across a range of issues, including accessing finance for climate action projects.